The Thunderbirds are mostly the Tracy boys, a father and four or five sons who clearly share neither personalities nor mothers, housed in their groovy pad on Tracy Island. (As only one son is given any sort of storyline, I never established how many of them there were. I also wasn't that inspired to check.) It's an incredibly impractical headquarters with vast underground facilities and retracting swimming pools, but back then you didn't picture future financial resources as having limits. They say that International Rescue vehicles aren't deployed unless people are in grave danger. I assume that's because of the price of gas. Each Tracy boy pilots a different vehicle; a space satellite, rockets, a plane girthy enough to put a Boeing Dreamliner to shame, and an underwater sub. The son saddled with the boat is given little to do but stand around and look dejected. This makes him the center of plot development. The remaining "Bird" is Lady Penelope (Lady Fab) in her customized pink Rolls Royce ("The Fab1") and massive mansion. She goes "deep undercover" as a reporter named "Lady Penelope." I guess if you've got a title you can do what you want. Soon, the Thunderbirds are working security at the second launch of the Zero-X while Lady P. hunts a heavy-browed saboteur. That dejected middle son, evidently named Alan (and doesn't he just seem like an "Alan," no?) gets a musical dream sequence, which is pretty much the point in the film when you'll wonder who dosed your drink. I have no cultural history with Cliff Richard, but it's safe to expect that his appearance here is a howler and a half if you do. Anyhow, the Zero-X makes it to the extremely Moon-like Mars, where what they find requires them to beat a hasty retreat, so saving them upon re-entry makes for a surprisingly thrilling (within context) climax for the movie. By this point, you'll have probably adjusted to the unreality of the whole thing and learned to appreciate the detail work and smart storytelling. It's engaging and intelligent while also family friendly. A rare treat. As a film set entirely among miniatures, so reminiscent of Godzilla and his Kaiju brethren and peopled with weirdly middle-aged puppets, there's no reason why it should work. Even with a sentimental attachment, I'm sure you'd have to admit these marionettes are damned creepy. Human hands infrequently are used in close-up insert shots, and they only underline how dead and artificial the characters look. Lady Penelope somehow achieves always looking uncomfortable while her chauffeur, Parker, is easily the least off-putting because he purposefully is a caricature. His cartoon features work in an unreality while everyone else just seems... icky. The Tracy family dynamic doesn't help either. You can't tell them apart, they live an insulated and entitled life with a bit of a "God Complex," and they evidently all tag along when one of them goes on a date. In the end, this is good, clean engaging adventure that'll charm little kids, intoxicated adults, those revisiting childhood, and anyone willing to give this curio a chance. 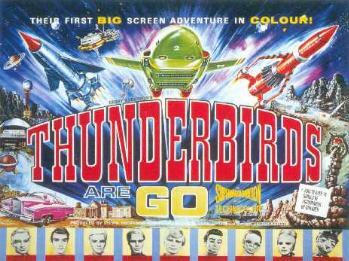 Thunderbirds are odd, Thunderbirds are weird, but Thunderbirds are FUN.